Provide comfort for the family of Hertha Hartfield with a meaningful gesture of sympathy. It is with great sadness that we announce the passing of Hertha Hartfield of Red Deer, Alberta, on Monday, April 1, 2019 at the age of 94 years. Hertha was born in Novo Pavlovka, Wolyn, Poland (now Russia) on December 15, 1924. She immigrated to Canada in 1949, settling in Lampman, Saskatchewan. Hertha lived with the Brown family, who sponsored her. She took jobs as a housekeeper for different families, until she met and eventually married Gustave Hartfield on April 15, 1950. Together they had four children. Hertha and Gustave farmed until 1984, and then moved into Lampman for their retirement years. 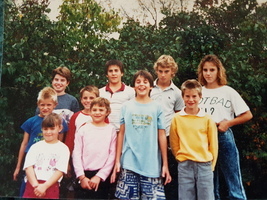 In 1995, Hertha moved to Edmonton, Alberta to be with her sisters and brother. She had eleven wonderful years of making new friends. In the summer of 2006, Hertha moved to Red Deer to be closer to her son and daughter-in-law, living in Club Sierra. In 2012, as Hertha’s health declined, she lived in Bethany CollegeSide, and resided there for six years. Her final home was in Harmony Care Home, Red Deer from February 2018 until April 1, 2019. Hertha will be lovingly remembered and survived by three children, Stewart (Darlene) of Red Deer, Sonja McDonald of Lethbridge, and Doug (Char) of Battleford, Saskatchewan; ten grandchildren and eighteen great grandchildren. She will also be sadly missed by four sisters, Lottie of Edmonton, Irmgard of Winnipeg, Violet and Giesla both of Edmonton, and one brother, Herb of Kamloops, British Columbia; as well as numerous nieces, nephews and friends. She was predeceased by her husband, Gus; her parents; six siblings; brothers-in-law, Ted and Ernest Hartfield and Adolf Becker; and most recently a daughter, Corinne (Rick) Wilhelm on February 14, 2019. The family would like to Thank Dr. Grundling for his compassionate care, as Hertha’s health declined through her difficult journey. Also, a special Thank You to Hertha’s Personal Caregivers who provided dignity, love and compassion through her difficult journey. A Celebration of Hertha's Life will be held at Parkland Funeral Home, 6287 – 67 A Street (Taylor Drive), Red Deer, Alberta on Saturday, April 6, 2019 at 11:00 a.m. Interment will take place at Woodley Cromer Cemetery, Woodley, Saskatchewan at a later date. If desired, Memorial Donations in Hertha’s honor may be made directly to the Alzheimer Society at www.alzheimer.ca. Arrangements in care of Parkland Funeral Home and Crematorium, 6287 – 67 A Street (Taylor Drive), Red Deer. 403.340.4040 or 1.800.481.7421. 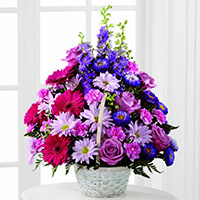 To send flowers in memory of Hertha Hartfield, please visit our Heartfelt Sympathies Store. Donations are being accepted for: ALZHEIMER SOCIETY OF ALBERTA AND NORTHWEST TERRITORIES. We encourage you to share your most beloved memories of Hertha here, so that the family and other loved ones can always see it. You can upload cherished photographs, or share your favorite stories, and can even comment on those shared by others. Spies Family and Hertha’s Family have sent flowers to the family of Hertha Hartfield. Hertha will be deeply missed. She was a very special member of our family. Spies Family purchased the The FTD Always Remembered Bouquet for the family of Hertha Hartfield. Doug/Char Our sympathy to you and your family. Cherish your wonderful memories and take care of each other. Thinking of you. Hertha’s Family purchased the The FTD Pastel Peace Basket for the family of Hertha Hartfield. Doug @ Char Our deepest sympathy of the passing of your Mother. May you find peace and love in the wonderful memories that you shared.